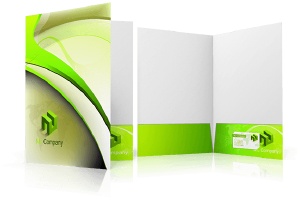 Full color presentation folders introduce your business in the most professional way possible. Head to your next networking event with these high quality lead generation tools at your fingertips. Convenient Compact 4" x 6", 6" x 9" and 5.25" x 10.5"
Our eye-catching full color Presentation Folders enable you to spark the interest of your target audience by showcasing your company information in a most professional and organized manner. Pocket folders are a great way to organize business proposals, company information, sample kits and more. Complete your promotional campaign with a full color presentation folders printed by Printfirm, Inc.
Our presentation folders are printed in full color on premium 14 point card stock with the choice of UV Coating on one or both sides, or a Matte Finish. Our 14 point card stock is known for its thickness and durability and popularly used for hotel key card holder, business cards, postcards, greeting cards, etc. Adding UV Coating gives it a high gloss finish which protects it longer from getting scratched or dirty while the Matte finish gives it a flat professionally feel. No matter what look you are going for, let Printfirm, Inc. help make your job easier. 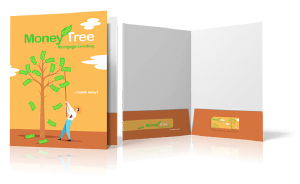 Our pocket folders come with an option of having a 4” pocket on the right, left or both sides of the folder, you also have the option of having business card slits on one or both pockets. We also offer a 3 panel pocket folder with the options of a pocket on any panel with business card slits. You can simply upload your ready to print artwork or choose from 1000's of professionally designed templates that meet your personal and professional needs.